A Canny Miracle – Looking So Good After Looking So Bad! Sharon Ballance of Khandallah owns a ‘character’ house built in the early 70’s with Italian marble bathrooms – one green and the other terracotta. 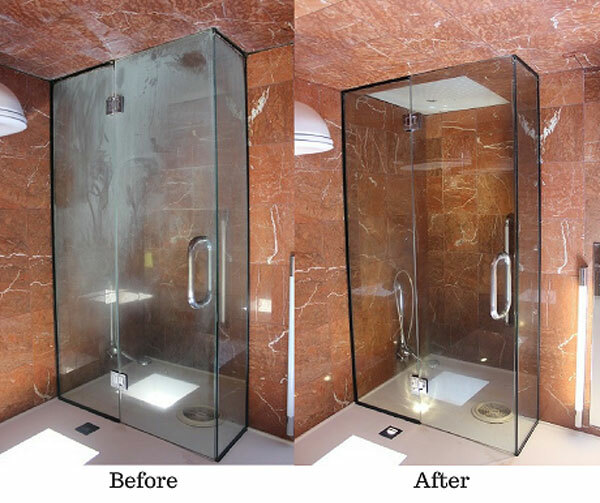 She says that although the showers looked cool with amazing quality, the marble and glass was badly water-stained. “By fluke we came across Cameron. I was doubtful that anything could be done, and said to him “I’m not sure you’ll be able to fix this. We were surprised to hear him say that the tiles and metalwork could be restored like brand-new, and the glass made much better. We appreciated him being realistic and honest about the practical limitations. He explained to us his ‘deep cleaning’ methods including the diamond grinder that doesn’t damage surfaces, and the protective coatings to preserve the as-new finish. He only proposed the work that was actually needed and no more – a cleanup of one shower and complete restoration of the other. Firstly all the mouldy silicon, water staining, and lime scale were removed. Then the chrome and glass were cleaned with an electric polisher, diamond rotary pads, and water spot remover. 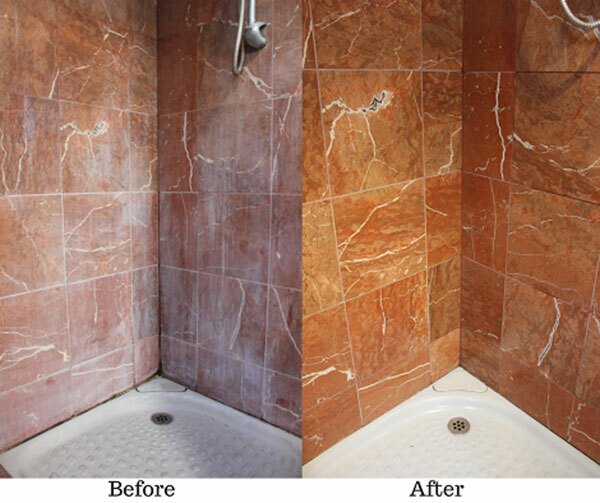 Aqua Mix EffEx™ was applied to give a deep clean to the natural stone and grout to remove limescale, soap scum, and mineral build up. Etching on the natural stone was removed using Diamond pads in a 3-step polishing process, restoring the original shine. Aqua Mix Enrich’N’Seal™ was used to enhance and protect the unique character of the natural stone. It also sealed and darkened grout joints, providing maximum stain protection. The glass surfaces were then treated with ClearShield protective coating for maximum stain resistance and easier ongoing maintenance. The last touch was a new silicone coating to make the bathroom look fresh and new. 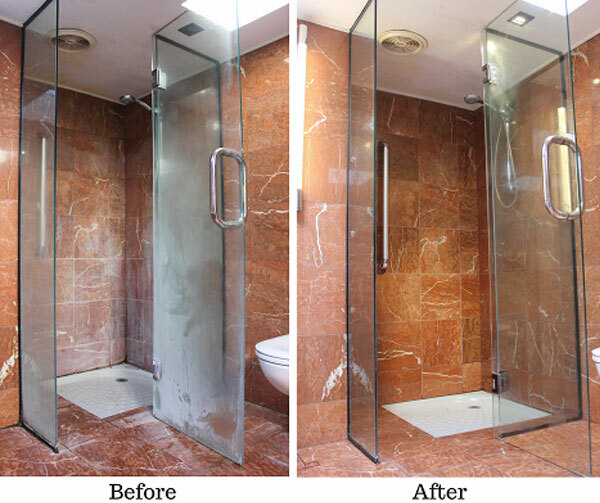 The cleanup of the other shower only involved restoring the glass, cleaning the chrome and sealing it. “When we looked at the showers after he finished we were abolutely stunned. OMG! How could it look so good after looking so bad! ‘You’re a miracle worker’. It was so good to see the original glory restored and get really helpful advice on how to keep the showers in good shape. 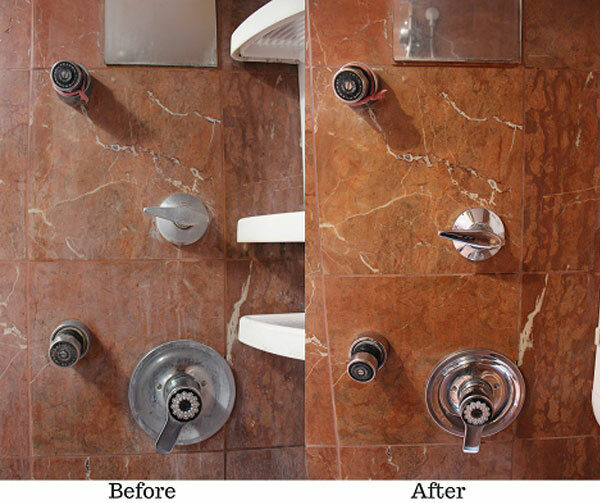 If you are frustrated trying to get your bathroom tiles, grout, metal surfaces, natural stone, and glass back to its original glory then check our products or contact us today.